Recently both the Italian and the Spanish governments have come out and said that they will have to revise their expectations for their budget deficits in negative direction. Similarly, there has been renewed budget concerns in Portugal and Greece. Hence, last week IMF chief Christine Lagarde expressed strong reservations about Greece’s ability to achievement its fiscal targets. So far the markets have reacted fairly calmly to rising concerns about the fiscal situation in particularly Southern Europe, but these concerns nonetheless raises the question whether or not we will see renewed euro zone financial turmoil again soon. Some are eager to claim that the failure to consolidate public finances in Southern Europe is a lack of effort to do so. However, the fact is that we have seen significant fiscal tightening in countries like Greece and Spain as illustrated by the graph below (the source is IMF and own calculations for all graphs in this post). What the graph is showing is the accumulative tightening of fiscal policy measured as the sum of yearly changes in structural budget deficit in the PIGS countries (Portugal, Italy, Greece and Spain) as well as Iceland. We use Iceland as an example of austerity in a non-euro country. The graph clearly shows that particularly Greece has tightening fiscal policy dramatically since 2009-10 and now has tightened fiscal policy by nearly 20% of GDP. We have also seen a dramatic tightening of fiscal policy ins Portugal and Spain (and Iceland), but less so in Italy. But how about the outcome? Lets look at the development in public debt. The outcome surely is depressing. Despite tightening fiscal policy by nearly 20% of GDP since 2009/10 public debt in Greece today is nearly 40%-point higher as share of GDP than at the start of the ‘austerity period’. And it is the same sad story for Portugal, Spain and Italy. However, if we look at Iceland the story is completely different. Here public debt is nearly 40%-point of GDP lower today than when austerity was initiated in 2010. So why did Iceland succeed with fiscal austerity while the PIGS have failed? Well, my loyale readers already know the answer – nominal GDP growth. Just take a look at the graph below. Greece have been a depression style contraction in nominal GDP and NGDP is today nearly 30% lower than at the start of the crisis in 2008 and for the rest of the PIGS-countries we are essentially at the same nominal GDP level as eight years ago! But then look at Iceland’s nominal GDP. Despite a total collapse of the Icelandic banking sector in 2008 and a sharp contraction in real GDP in 2008-10 nominal GDP grew through the crisis years (2008-10) and has grown robustly since then. Some – including me – would even argue that NGDP growth in Iceland has been growing too strongly. So why this difference in NGDP growth between the PIGS and Iceland? Well it is simple – it is all about the monetary policy regime. The PIGS countries are of course euro members and have not seen enough monetary easing to get NGDP growth back to decent levels of 4-5%, which would be comparable to ECB’s 2% inflation target. On the other hand Iceland has seen significant monetary stimulus in the form of a sharp depreciation of the Icelandic króna and a drop in interest rates. As a result monetary policy has more than offset the negative impact on aggregate demand from fiscal policy in Iceland and this is the real reason for the success of fiscal consolidation in Iceland. This obviously has not been the case in the PIGS countries, where monetary policy has failed to offset the negative impact on demand from the fiscal austerity measures. This also leads me to the clear conclusion that we are very likely to see a continued increase on public debt-to-GDP ratios in the PIGS countries if the ECB fails to fundamentally and permanently lift NGDP growth in the euro zone to at least 4-5%. Until that happens the PIGS countries have no other option that to continue to the fiscal austerity measures, but it is very unlikely to succeed for long unless we see a pick up in growth. Therefore, policy makers in the PIGS countries should rather focus on growth enhancing policies such as cuts in corporate taxation and labour market deregulation and maybe also more immigration rather than on focusing on fiscal austerity. But the most important thing will be for the ECB to end the deflationary pressures in the euro zone economy. A 4% NGDP target accompanied by significant open-ended quantitative easing would do the job. Unfortunately I have little hope for either reforms in the PIGS countries or a fundamental monetary policy regime change so I continue to think that we could very easily see an other of ‘euro turmoil’ in the coming months. The Arab Spring started in 2010-11 in Tunisia and until now Tunisia has been highlighted as basically the only country, where the Arab Spring has not ended in disaster. Unfortunately over the last couple of days social unrest and violent confrontation between demonstrators and police have erupted across Tunisia. I this blog post I will have a look at the Tunisian economy and try to give my take on what is wrong with the economy. There is of course a lot of ground to cover and I can naturally not cover it all in one blog post, but I will try provide an overall framework for how to understand the economic situation in Tunisia. A look at real GDP growth in Tunisia shows that the economy essentially has been suffering since the outbreak of the Arab Spring in 2010-11. Prior to 2011 real GDP growth was averaging 4-5% a year – not very impressive given the high growth rate of the labour force and compared to for example Turkey, but nonetheless fairly robust and stable growth. However, during the 2011 revolution GDP drop in around 2% and after initially recovering in 2011-12 growth have once against slowed significantly and as a consequence the level of real GDP today is more or less unchanged compared to early 2011. 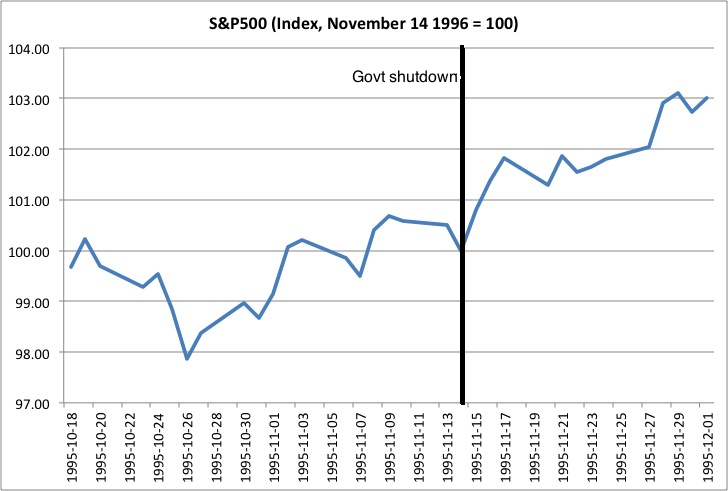 It is hard not to see the latest social unrest and demonstrations in the light of this lackluster economic performance. Whenever I want to analyse the economic situation in any country in the world I find it very useful to start out with a simple AS/AD framework. I particularly like the AS/AD framework described in Tyler Cowen and Alex Tabarrok‘s textbook Modern Principles. 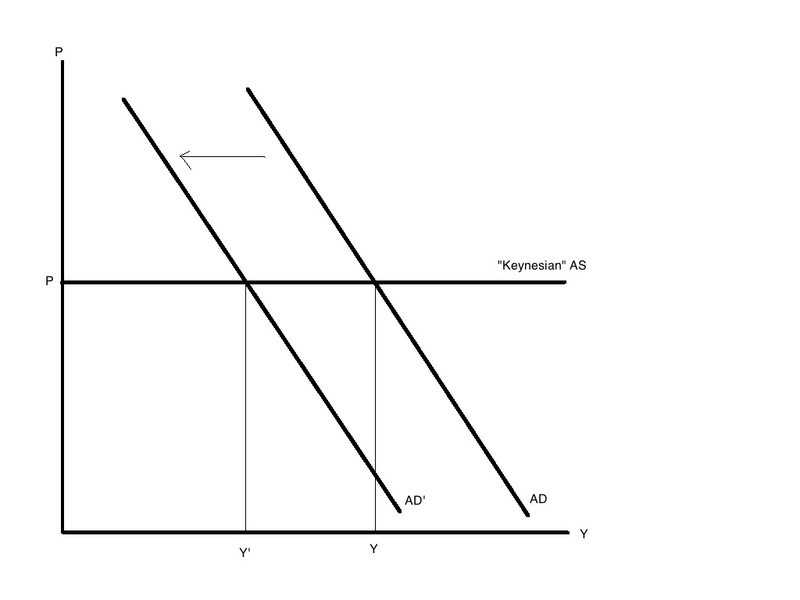 This gives us the possibility to think of three kind of shocks to the economy – An Aggregate Demand (AD) shock (essentially a monetary demand shock), a short-run Aggregate Supply (SRAS) shock and a shock to the long-term growth rate of the economy (this is also supply shock). Cowen and Tabarrok terms the long-term growth rate the Solow growth rate after Robert Solow’s famous growth model. We can relatively easily apply this model to the Tunisian economy and by looking at the development in inflation and real GDP we can assess whether the development in the economy is driven by supply shocks or demand (monetary) shocks. 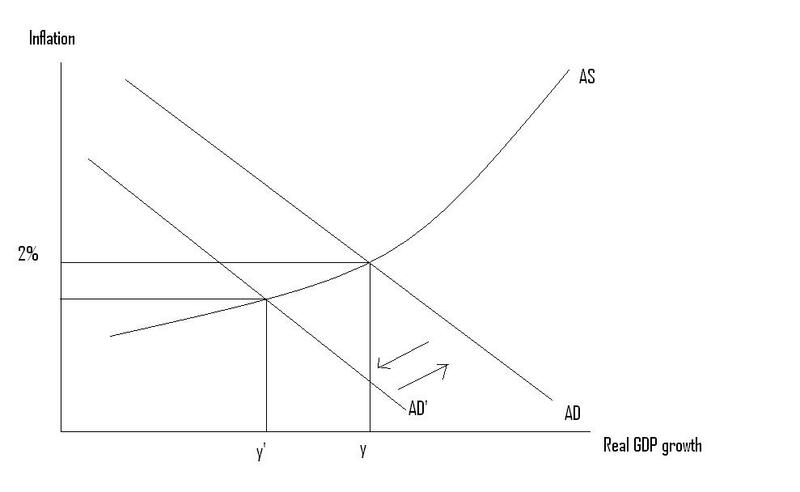 If the economy is hit by a negative demand shock – either a contraction in the money supply/base or a drop in money-velocity – the AD curve shifts to the left causing both inflation and real GDP to drop and hence therefore also nominal GDP to drop. 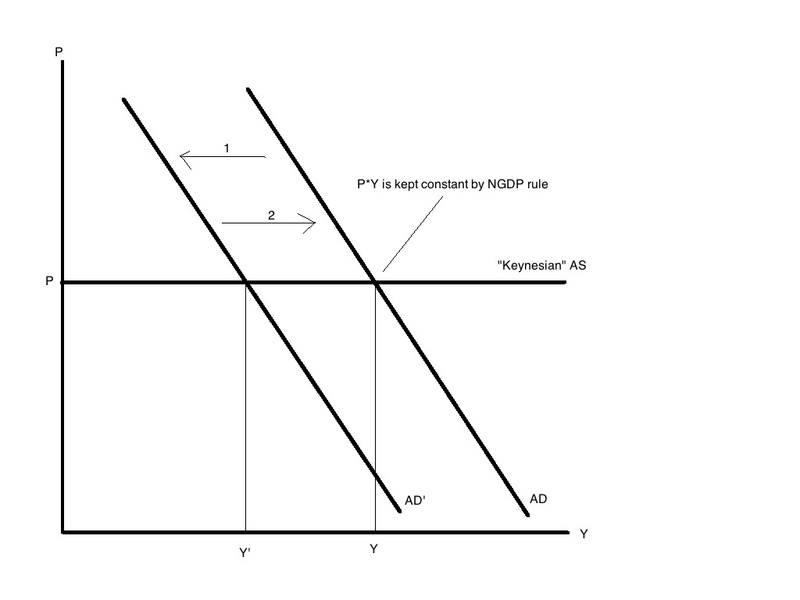 The graph below shows the development in real GDP (y), nominal GDP (y+p) and the GDP deflator (p) in Tunisia. The graph shows that over the past 15 years nominal GDP growth has been relatively stable about 8% and even though there was a slowdown in nominal GDP growth in the period 2008-11 we have since seen a rebound in NGDP growth back to the old trend about 8%, which indicates that there has not been a major negative demand shock to the Tunisian economy. This is further confirmed by the fact that inflation – measured by the GDP deflator – has in fact shifted upwards since 2010-11. If there had been a negative shock to aggregate demand (AD) we would have expected inflation to drop rather than to increase. This all indicate that the we cannot blame the the present crisis on monetary policy failure and in fact the Tunisian central bank deserves some credit for – knowingly or not – to have kept nominal GDP on a pretty “straight line”, which in my view certainly is the preferable monetary policy. This obviously does not mean that monetary policy is perfect – far from it – and I certainly think that monetary reform is badly needed to ensure that monetary policy failure is avoided in the future, but at least over the past 15 years the Tunisian central bank very broadly speaking has got it more or less right. The biggest risk as I see it now is that the central bank will be tempted to focus on inflation rather than nominal GDP growth and that that might cause the Tunisian central bank to tighten monetary conditions unduly in response to rise inflation caused by non-monetary factors (a negative supply shock). The best away of avoiding this is to communicate and explicitly target nominal GDP growth at 8% as de facto has been the policy for the past 15 years. Alternatively the central bank could target nominal wage growth as a proxy for NGDP growth. As the discussion above slows the main problem in the Tunisian economy right now is not a lack of demand and monetary policy failure cannot be blamed for the marked slowdown in growth particularly since 2011 and the crisis can therefore not be resolved through an easing of monetary conditions. As a consequence we have to conclude that the problem is one of real factors (the supply side of the economy) rather than nominal factors (monetary conditions). The question is, however, whether the the slowdown in growth is permanent or temporary. 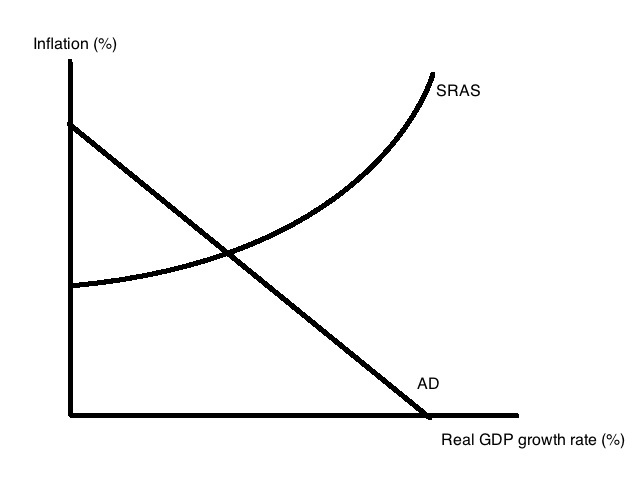 Said in another way has the crisis been caused by a shift to the left of the Short-run Aggregate Supply (SRAS) or is it rather the Solow growth curve, which has shifted to leftwards? Whether it is the SRAS curve or the Solow growth curve, which has shifted leftwards does matter in terms of the impact on the economy presently, but only a shift in the Solow growth curve should be expected to cause a permanent decline in the long-term growth rate of the Tunisian economy. Below I will argue that it is a bit of both, but that it likely is short-term shocks that has dominated in the last couple of years. Tunisia has been hard hit by a number of terror attacks in recent years and particularly in 2015 a number of horrible terror attacks hit Tunisia. One can think of a terror attack both as a demand shock and a supply shock. Hence, it is obvious that a terror attack will tend to scare tourists away and this is certainly also what we have seen. This obviously is a negative demand shock. However, as we have seen above the Tunisian central bank has more or less kept nominal GDP growth on a 8% growth path. This means that any drop in tourism revenues will be compensated by higher demand growth other places in the economy. 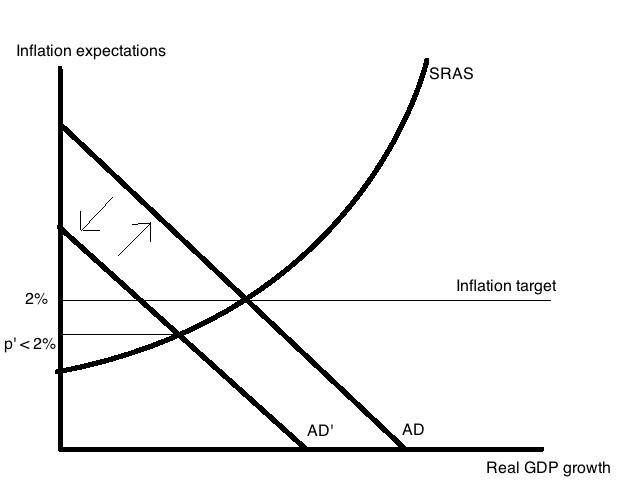 This essentially is a version of the so-called Sumner Critique, which says that if a central banks targets nominal GDP or inflation then it will keep aggregate demand growth stable and this will offset other shocks to aggregate demand. Obviously Tunisian nominal GDP growth has not been completely stable at 8% and we have indeed seen a drop in NGDP growth over the past year, which do indicate some contraction in aggregate demand growth, which could indicate that the Tunisian central bank has not fully offset the shock to aggregate demand from the drop in tourism revenues, however, if the Tunisian central bank – hopefully – continues de facto to target 8% NGDP the effect on aggregate demand from the tourist attacks should prove to be short-lived. More worryingly is, however, the fact that the threat of new terror attacks and more generally speaking the rise of islamist extremism is causing a more permanent increase in the cost of doing business in Tunisia. It is hard to quantify just how big these effects are, but it is notable that real GDP slowed from around 2% to 0% during 2015 so the effects have certainly not been small. Whether they are permanent is another question. When I started to think about the slowdown in the Tunisian economy I initially thought that it mostly was about the terror attracts in 2015 and I was unaware of something, which in reality is at least as important – namely what we could term the ‘Phosphate Crisis’. The struggles faced by Tunisia’s economy following its 2011 popular uprising have been exacerbated by a decrease in phosphate production, one of the country’s most lucrative resources. Production fell from 8 million metric tons a year to 2.7 million metric tons in 2012. Financial losses reached 3 million dinars ($1.82 million) a day, amounting to a loss of nearly 2 billion dinars ($1.22 billion) in 2011 and 2012. The phosphate company’s workforce tripled from 9,000 to 27,000 workers over the course of three years. The government even went so far as to threaten to shut down the Gafsa Phosphate Co. The threat baffled [Tunisians], as the company serves as the only operator in mining basin cities and because phosphate is considered a significant source of hard currency in the country. Additionally, the government is currently experiencing several crises of its own, so this sort of escalation would not balance in its favor. Is the threat a political maneuver or an official admission of failure? If the latter is true, does the admission pave the way for the state to give up on “reforms” in the phosphate sector? Even though the official rhetoric considers the Jan. 14, 2011, Revolution, which toppled Ben Ali, a societal revolution whose flame has been sparked inside the mining sector, all of the post-revolution governments have only shallowly looked into the problem, resulting in the adoption of ineffective administrative solutions. While this is from a 2013 article the crisis continues to this day. Just have a look at this graph of the output in the Tunisian mining sector. Hence, mining output dropped sharply in 2011 and has remained more than 30% lower since then. This obviously is a major negative supply shock to the Tunisian economy and it seems of outmost importance to solve this crisis to get the Tunisian economy out of this crisis. At the core of the protests in 2011 was anger over the widespread corruption in Tunisia and corruption remains a main problem for the Tunisian economy and it is certainly something, which is causing long-term growth to be lower than it could be been (permanently shifting the Solow curve to the left). The graph shows Transparency International’s so-called Corruption Perception Index. A lower score in the index indicates more corruption. The development is far from uplifting. In fact of nearly 15 years corruption has been constantly rising in Tunisia as seen by the consistent drop in the Corruption Perception Index. Another factor that is contributing to shifting the Solow growth curve to the left – permanently lowering real GDP growth – is the fact that despite of the democratic revolution in Tunisia the general business environment has become less friendly. A way to illustrate this is to look at the World Bank’s Ease of Doing Business survey. A rise in the index indicates a worsening of the general ‘ease of doing business’ in Tunisia. The picture since 2010 is clear – the business environment has become less friendly in Tunisia. This surely is something, which is lowering Tunisia’s lower term growth potential. A similarly negative trend is seen in for example Fraser Institute’s Economic Freedom of the World survey, where Tunisia’s overall ranking also have been declining in recent years. Tunisia is in the midst of a serious political, social and economic crisis. In this blog post I have tried to give an overview of what I believe are the main causes of the economic crisis. Despite the fact that the that Tunisia monetary policy overall has been successful in maintaining nominal stability in the past 15 years monetary reform is needed to ensure that nominal stability is also maintained in the future. A starting point for reform should be to the succes of monetary policy in the past 15 years – that means any new regime should continue to ensure nominal GDP growth around 8%. That would also ensure low and stable inflation in the future. The threat from terrorism and extremism should to be reduced. That is partly a question of law enforcement, but much more likely it is of outmost importance to empower low-income Tunisians so they to a larger extent are in control of their economic and social destiny and to create economic opportunties for all Tunisians. Other than general economic reform I also think that Tunisians should be given direct ownership of Tunisia’s many government owned companies for example through a Citizen’s account framework. Bold steps are needed to end the crisis in the Tunisian mining sector. Here privatization of the mining sector should be at the core of these efforts. Long-term economic growth needs to be increased through massive structural reforms with the purpose to reducing government intervention in the economy and empowering the Tunisian population. Overall, I think Tunisia has an enormous economic potential – the country has a young and growing population, relatively low public debt, a historical and geographical closeness to (Southern) Europe and by Northern African standards a relatively open economy and access to (some) natural resources. However, Tunisia cannot unleash this potential without reforms. We have had political revolution – now we need an economic revolution to free up the Tunisian economy. FIVE years ago, nearly every macroeconomist agreed that central banks determined aggregate demand (total spending in the economy), and that fiscal stimulus was therefore unnecessary to lift depressed economies. Conversely, fiscal austerity was seen as irrelevant at best for overall growth; any impact of austerity on demand can be offset by the right monetary policy – though tax cuts could, of course, boost aggregate supply. But the age-old discussion about the relation of fiscal policy to growth has resurfaced. Keynesian economists – including Òscar Jordà and Alan M Taylor in a paper just released by the National Bureau of Economic Research – claim that government austerity is to blame for lacklustre UK growth since 2010. There are technical issues with the paper that make Taylor and Jordà’s precise numbers hard to evaluate. And as the economist David B Smith has noted, the important question of fiscal sustainability is not even addressed. But the more fundamental issue in the whole debate is the idea of “monetary offset”.